Last year I showed you this large mural project under construction. Here are a couple of details from the mural. The project covers a freeway overpass and most of its support pillars in the Temescal-Telegraph neighborhood. 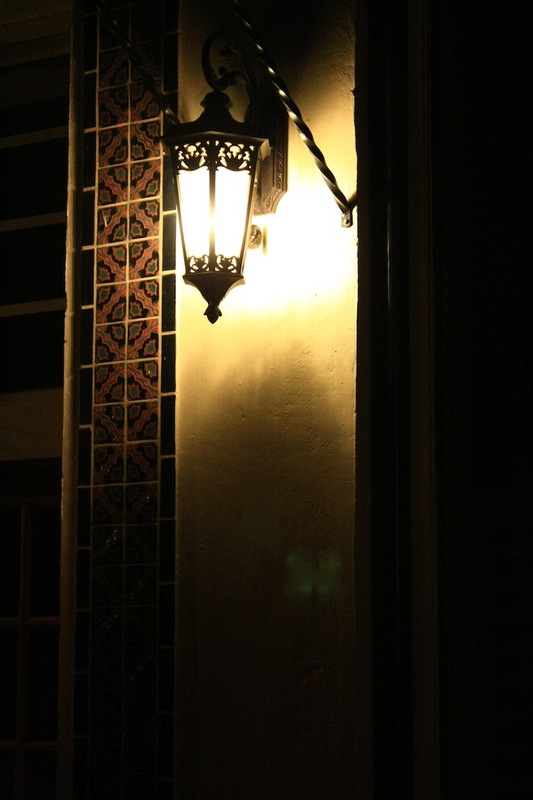 The dominant motif represents Temescal Creek which now flows underground in this neighborhood. The mural has been so successfully received by the community, that the colored lines representing the flowing water of the creek have now been adopted for the neighborhood banners on Telegraph Avenue. These yellow paper lanterns really spoke to me. Their reflections is the window was a bonus. 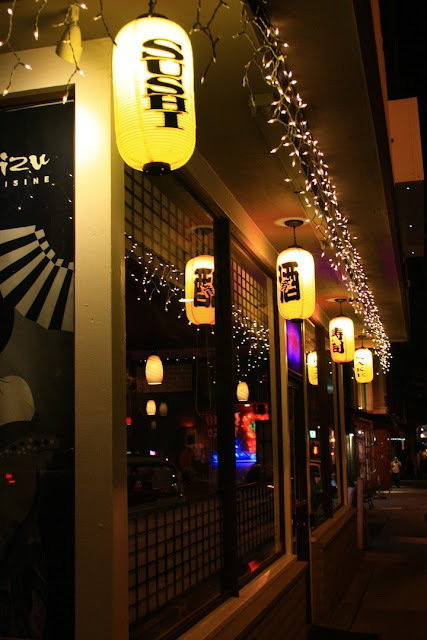 Shimizu Restaurant on Piedmont Avenue. For more reflections visit James's meme Weekend Reflections. Also linked to City Daily Photo's Theme Day, electricity. 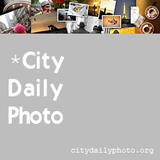 Click here to view thumbnails for all participants. I wonder what it's like living in a converted theater? This is the site of the Allendale Theater constructed in 1927 at the beginning of talkies era. It is located in East Oakland at 38th and Liese Avenues just below MacArthur Blvd. Surprising to me, the theater was converted to apartments in 1949! I thought conversions like this were a recent phenomenon. This week we're visiting Flora at 19th and Telegraph Avenue in Uptown. It is housed in a stunning art deco building faced in cobalt and silver terra cotta tile previously featured here. 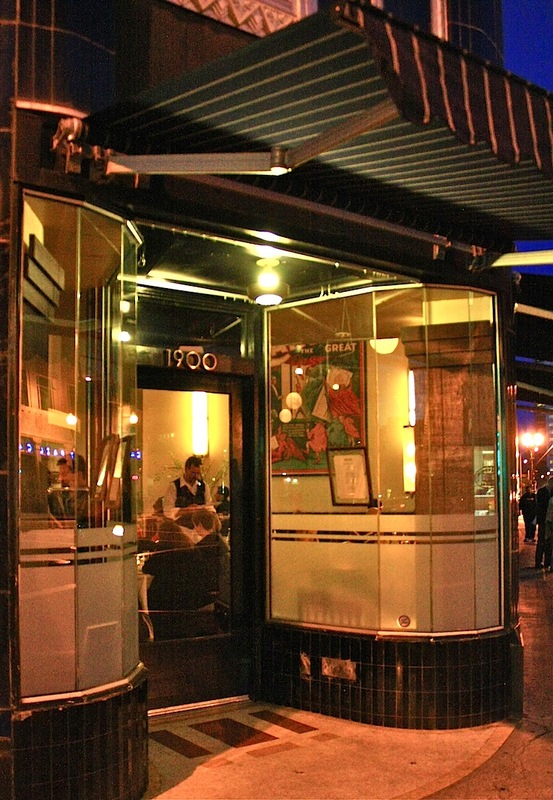 Flora opened in 2007 and was an anchor business in the revival of Uptown. The old neon sign that marked the flower mart was restored by the restaurant. This is a popular and welcoming restaurant that is best visited with reservations. A sidewalk peek into Flora shows it's busy even at the early dinner hour. The entry reveals its deco roots are undeniable. 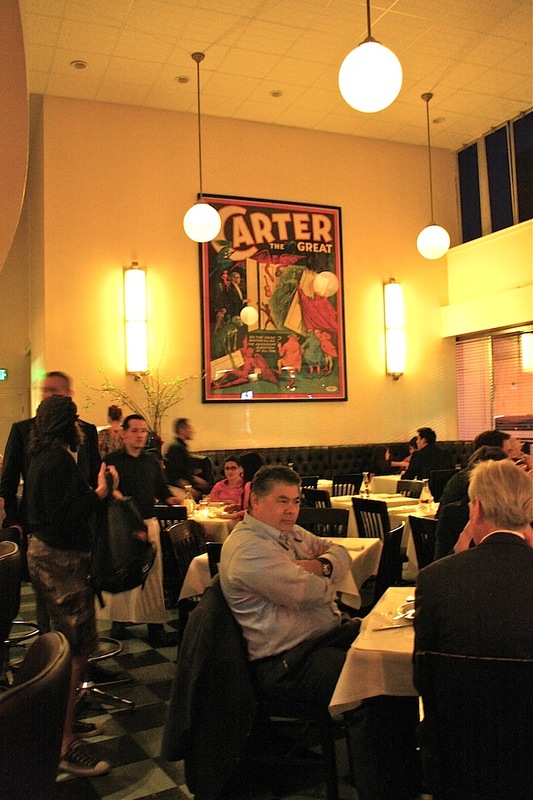 The inside is noisy and convivial with simple but pleasing decor. It's on the pricey side but the food is very good. The new cocktail generation kept the bartenders busy the entire time we were there. I had a New York strip, which was probably the tastiest steak I've ever had. No exaggeration. So, thumbs up. For other takes on the letter "F", visit ABC Wednesday. More shots from Mt. View Cemetery. This is a series of family tombs designed by architect Henry Hobson Richardson. He included elements of Romanesque architecture in his structures. For some reason, I think of beehives when I see them. Although they look identical, there are subtle differences between the buildings. These mausoleums house prominent San Francisco families beginning with scions who died near the turn of the 19th century. Even for San Franciscans, Oakland's Mt. View Cemetery was THE place to be buried. More detailed information can be found at Lives of the Dead, which tells the tales behind the tombs. Linking today to Julie's Taphophile Tragics. 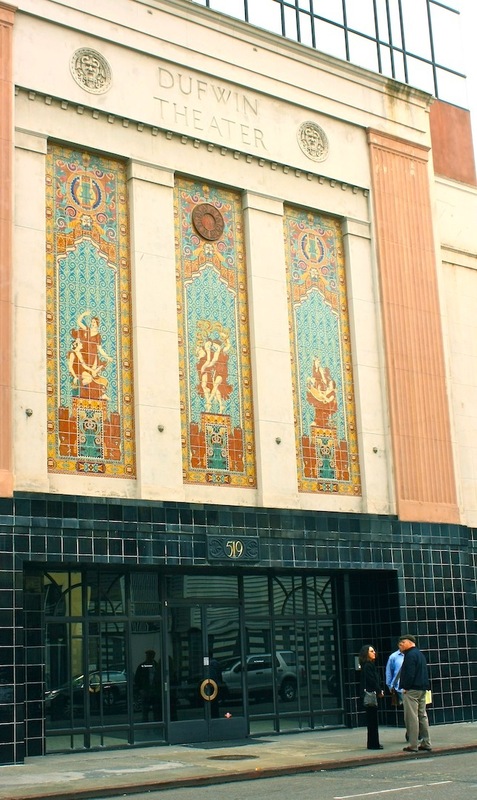 The Dufwin Theater, located Uptown at 17th and Telegraph, was built in 1928 and adorned with these tile mosaics created by the local Gladding, McBean Company. Two years later the theater was converted to a movie house and renamed the Roxie. Somewhere along the way the murals were covered up and forgotten. In 1983 the building was again renovated and turned into office spaces. During the renovation the tile murals were uncovered and restored. They appear to represent drama, dance, and music. 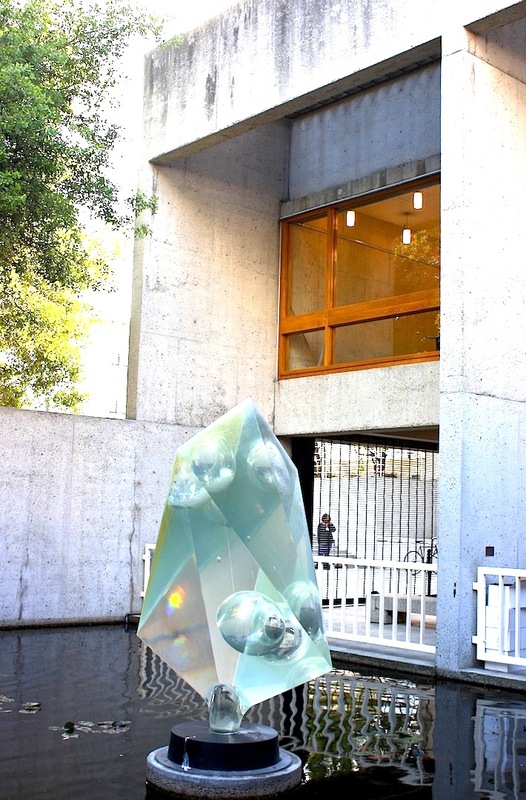 The Oakland Museum pond features both a sculpture and a bale of turtles. The turtles especially draw the attention of children. Considering the museum hosts over 30,000 school children a year, that's a lot of turtle watching. For more reflective shots, visit Weekend Reflections. Spotted outside of the gates of Mt. View Cemetery. Edson Adams was one of the founding fathers of Oakland, which was incorporated in 1852. He came out to California during the Gold Rush and eventually made a fortune in real estate. The title of "founder" suggests an illustrious career that actually had a seamier side. He and his partners essentially stole the land from the Peralta family, which owned much of the East Bay through a land grant from the Spanish king. Of course, the Peraltas (and the king for that matter) had themselves taken the land from the native peoples who lived in the area millennia before the Europeans arrived. 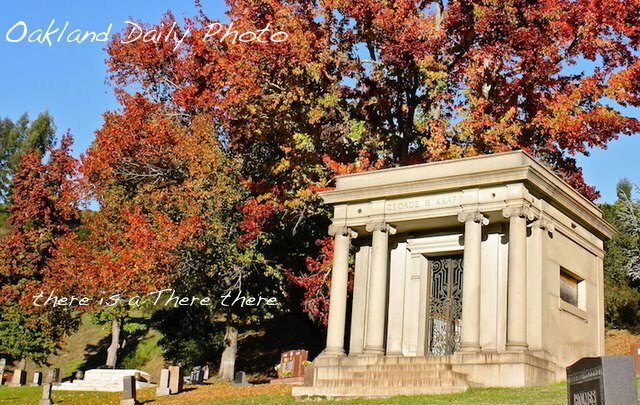 As befitting a prominent citizen, Adams' family mausoleum is built into a hillside at Mt. View Cemetery where succeeding generations of the Adams family are also interred. For more cemetery wanderings, visit Julie's meme Taphophile Tragics. This is a section of a larger mural found on E. 7th St. Near Fruitvale Avenue. It was recently done by students at Arise High School under the guidance of the Community Rejuvenation Project. CRP is the organization behind many of Oakland's murals. 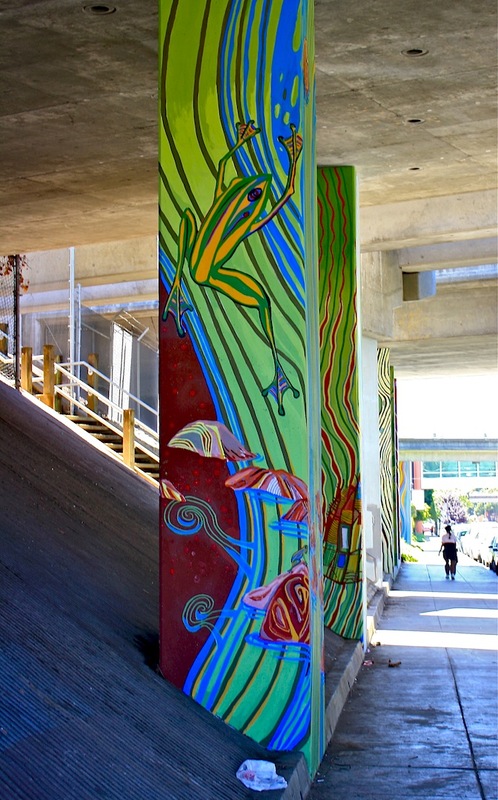 Many of Oakland's well known muralists help students design and execute these murals. If you like murals or have a mural you'd like to post, this meme's for you. Just follow the Linky steps below. You get to decide what constitutes a mural. Be sure to link back to this blog and visit your fellow posters. Can't wait to see the mural finds posted this week. After I took a picture of this mural, I noticed it reflected in the tiles on the building across the street. Since I also love the old tiles that decorate so many of Oakland's buildings, I had to take a picture of this one too. I like the abstract, watercolorish, fractured quality of the reflection. But I agree, without an explanation, you don't know what you've got here. For more reflections, visit James' meme Weekend Reflections. 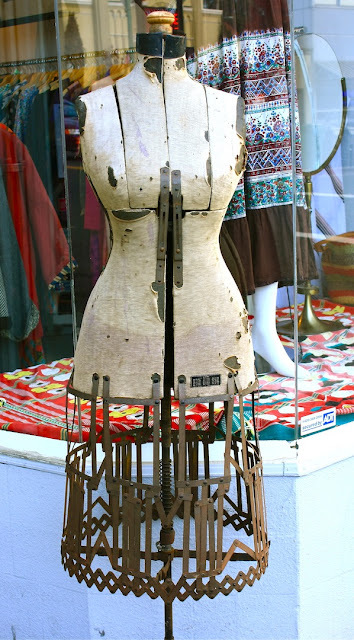 A vintage clothing store on Piedmont Avenue. 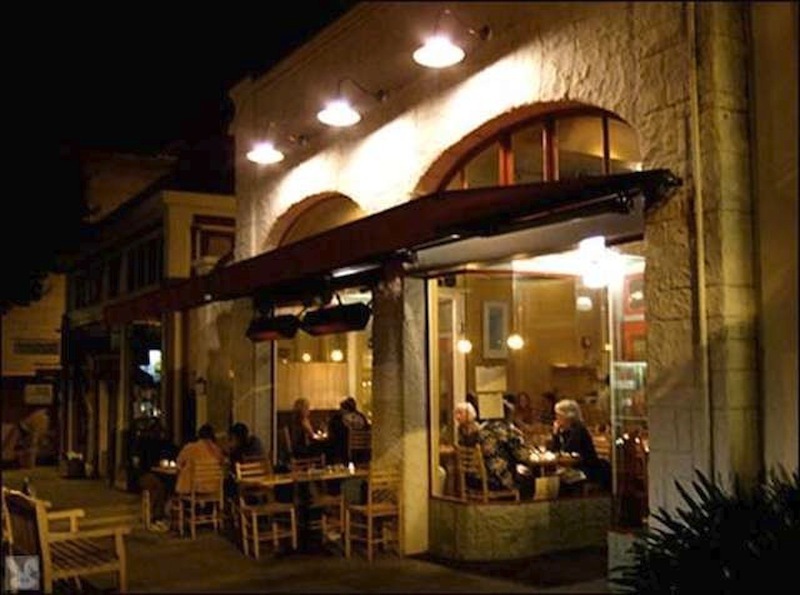 Dopo is a small Italian restaurant on Piedmont Avenue. It is often touted as having authentic Italian food, which I'm not sure is literally true. Nonetheless, the food is very good and reasonably price, especially if you go for lunch. Most people go for the thin crust pizza but you shouldn't overlook the risotto and their fish dishes. They don't take reservations, so lines begin to form before they open for dinner. 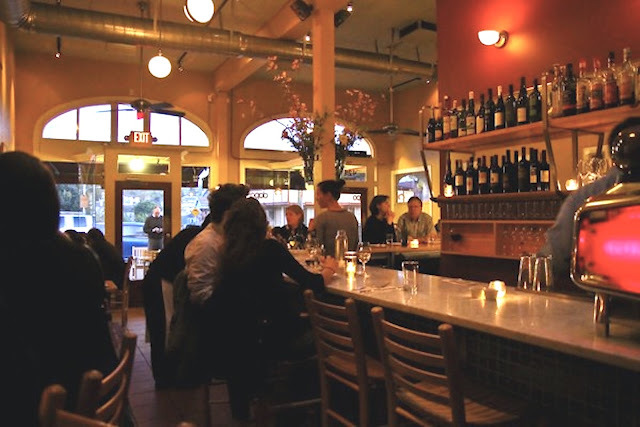 Up the street is their sister restaurant Adesso, which focuses on house-made salume. On any given night both places are usually packed. Sometimes time flies at warp speed and consequently I wasn't ready for my Wednesday post; so once again I caged photos from Google. Bad me. But honest, I've been to Dopo several times. No doubt as punishment for not using my own photos, I can't get this second picture to center. Grrr. Be sure to visit ABC Wednesday for more takes on the letter "D". Here is a detail from a larger mural previously featured here. It presents a dignified portrait of Marcus Garvey, who lead the Back to Africa movement of the early 20th century. 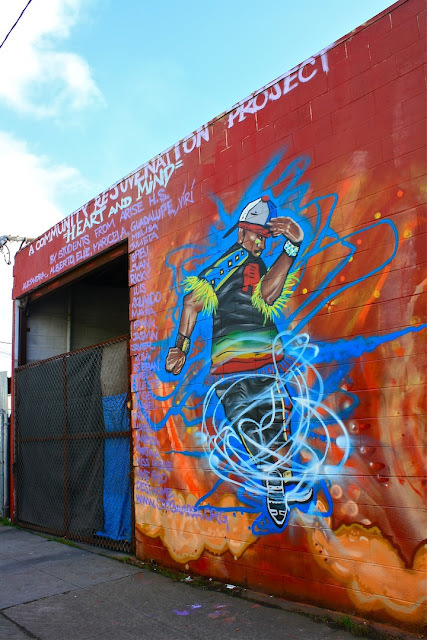 This is a work from the Community Rejuvenation Project, which is responsible for many of Oakland's murals. Last week I was on Treasure Island for the monthly antiques fair. The weather was glorious and the killer views could not be beat. The new eastern span of the bridge is progressing, with the gigantic support tower now in place. The Oakland hills are in the background. Note the four catwalks at a steep 45∘angle to the tower. Bridge workers must have nerves of steel to climb these structures. The new span connects to Yerba Buena Island where it joins the suspension section that goes to San Francisco. The new section will also be a suspension bridge and is scheduled to open next year. Check out the bridge website for all kinds of fascinating information. Since a bike lane is included in the design, I hope we'll be able to walk on the new bridge. This photo is doing double duty this week and is linked to Weekend Reflections and Sunday Bridges. Here's a longer shot of the Chapel of Memories featured in Tuesday's post. It's been cloudy in the morning and late afternoon, but rarely any rain. Our annual average to date is usually 13 inches; so far all we've had is 5. We all like the fair weather, but there's also an undercurrent of fear of another drought. For more sky shots and weather comments, visit Skywatch Friday. 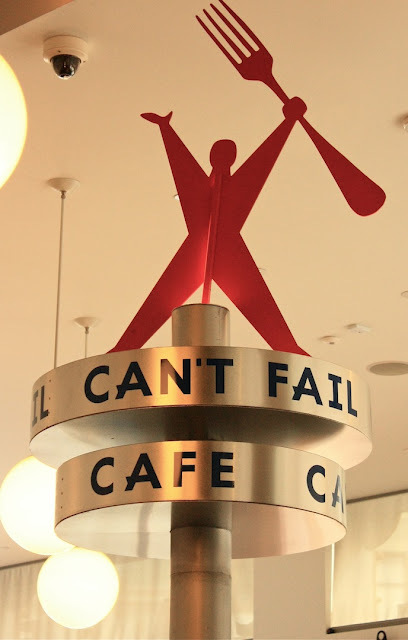 (Rudy's) Can't Fail Cafe is located in Uptown on Telegraph Avenue next to the renovated Fox Theater. It is easily distinguished by its blue neon sign and giant palm tree in front. Even just ordering a coffee guarantees you a warm welcome and friendly chit-chat. The decor is kitschy and fun. Along one wall is a 20 foot case filled with Barbie and Ken dolls wearing a blue and black uniform and a button saying "I am Rudy." Closer inspection reveals that many of the dolls have been "modified" to include masks, C3PO heads, Wonder Woman lariats, feathers, and other amusing details. The tables on the other side of the cafe are essentially shadow boxes with themes including Star Wars, rock and roll, and children's game pieces. 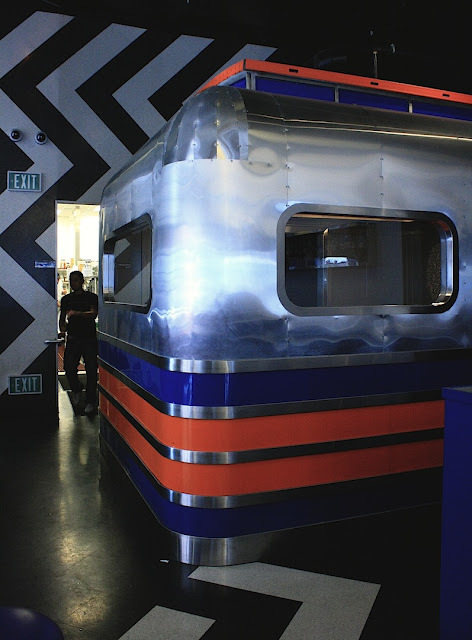 In the rear of the cafe is the back end of an Air Stream trailer that has been hollowed out to house a private booth. I didn't order anything to eat, but in the brief time I was there several more parties came in for a late lunch. So the food must be good and the Yelp crowd generally approves. I hear it's a hipster scene at night which is both bad and good depending on your point of view. For more takes on the letter "C" be sure and visit ABC Wednesday.